“The King of Cacao” beans impart a beautifully rich flavour. Many studies show cacao have positive effects to cognitive function. Chemicals provide a noticeable increase in mood and general feelings of well-being. The flavonoids in Cacao have been shown to prevent cardiovascular disease. WHAT MAKES OUR CACAO SO SPECIAL? Our Cacao is grown from the Criollo Cacao beans. This species of Cacao is known as ‘The King of Cacao’ due to low fermentation. Our Cacao is cleaned and dried at very low temperatures to prevent heating and loss of nutrients. It comes to you certified organic so you know it is free of pesticides, herbicides and radiation. 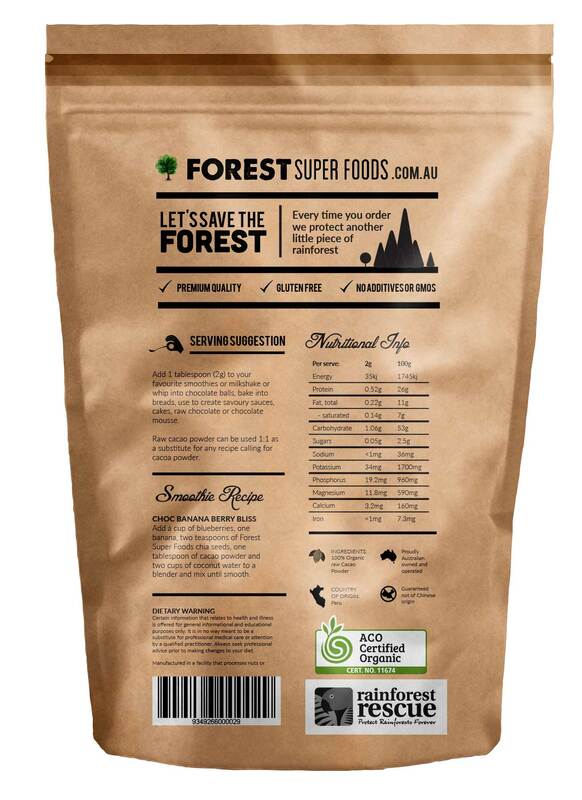 This product is guaranteed 100% Cacao with no fillers or additives of any kind. 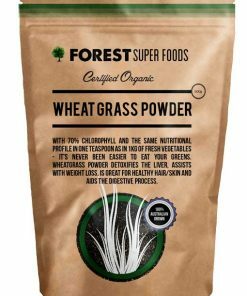 This is the tastiest cacao powder I’ve ever bought – and it works particularly well with green boosters if you don’t like the ‘green taste’. Highly recommended.. I have never tasted Cocao as good as this. It’s rich, bitter flavour makes a delicious nightcap. Just mix with a little hot water, then add hot milk and sweeten to taste. The added bonus is that you know it it doing you good! Have used raw Cacao for a long time but this is so fresh, so strong! Can’t have it in the evening as it keeps me awake. Love to put a spoon full on my freshly ground coffee beans, yea! Great service! Fast delivery again! 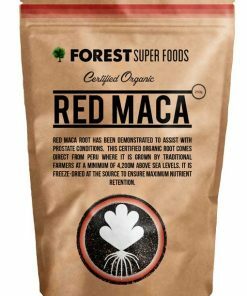 Various tribal cultures, including the ancient Aztecs, are known to have used this super food as a stimulant, mood-lifter and general source of nutrition. Cacao beans were even used as currency in Central America many centuries ago. Raw cacao powder can help to encourage positive, happy feelings due to it containing pleasure-boosting chemicals. The neurotransmitters regulate the pleasure centre in the brain, and cacao powder has enough of these pleasure-boosting chemicals to provide a noticeable increase in mood and general feelings of well-being. People often confuse Cacao with cocoa as they both come from the Coco bean. The difference is that cocoa is usually highly processed to the point where it loses a lot of its health benefits. 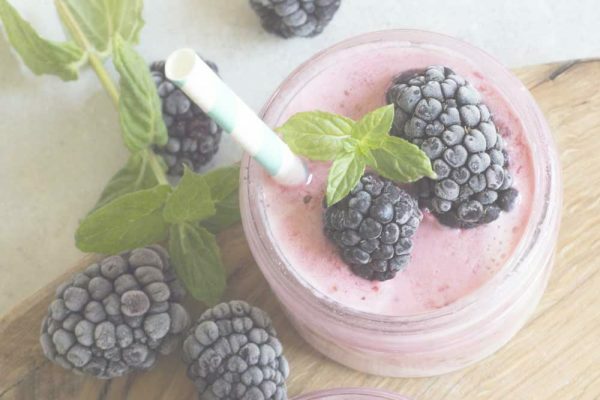 Add 1 tablespoon (2g) to your favourite smoothies or milkshake or whip into chocolate balls, bake into breads, use to create savoury sauces, cakes, raw chocolate or chocolate mousse. Raw cacao powder can be used 1:1 as a substitute for any recipe calling for cacoa powder. 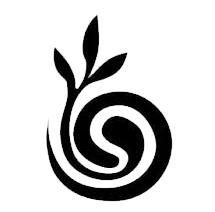 100% Certified Organic Cacao Powder. Our certified organic Cacao Powder comes from the Peruvian Amazon. It is fair trade and single origin. Our Cacao Powder has no fillers, additives and comes to you raw and unprocessed. Discover why so many Australians are replacing their refined Cocoa with our raw Cacao. Love this with smoothies and perfect to flavour nana icecream. Divine! The only cacao we will buy now! This is the best quality cacao and the best tasting! 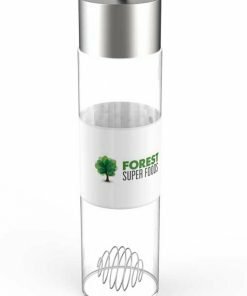 We use it for hot drinks, homemade chocolate, baking and more. It is so versatile and is such a great company to support. The customer service is fantastic and shipping is fast! 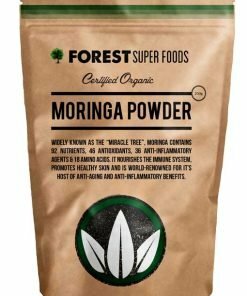 I’ve been using this product for a few years now and I wouldn’t buy any other cacoa powder as this is the best I’ve ever used… great texture and taste and great value. Best tasting Cacao. Gives my smoothies a very smooth texture. I just love it. Love this product, I make Hot chocolate with the Cocao, red Maca and Black Maca.. Love the taste. 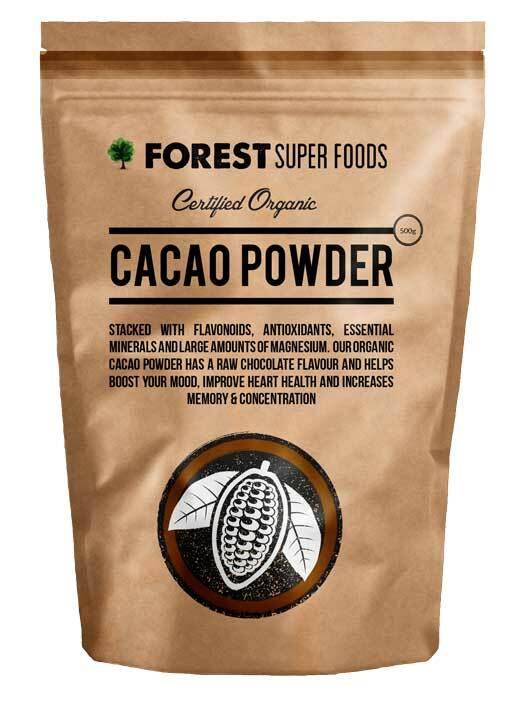 This is the tastiest cacao powder I’ve ever bought – and it works particularly well with green boosters if you don’t like the ‘green taste’. Highly recommended. I love my chocolate! I need my chocolate! And now I can have it guiltless in lots of different ways thanks to your organic cacao powder! Great product! We wanted more flavours in our morning smoothie and I love this Raw Cacao Powder. Tasted so good and so rich. Will be trying with different recipes with this! A high quality product that tastes delicious and is ethically made. I absolutely love it! My daughter loves the organic raw cacao powder so much she puts it in almost everything! Have to admit I don’t complain because it is really good. Fast postage and after sales contact and top products, I will order again. A great cacao powder. Good taste, good colour, and free flowing without lumps. I will be reordering this cacao powder again – and again -and….. This cacao powder is excellent quality. Everything from this site is, coupled with the super fast delivery forest superfoods delivers a fantastic service and product. I love making my chocolate chip icecream for my family using frozen bananas, this cacao powder, cacao nibs, almond milk, macadamia nuts and raw honey. Sooo good! I had been drinking a dark cocoa until I tasted your cacao and I am pleased to tell you I approve of your product. Your courtious service and prompt delivery delivery made this a pleasant transaction. I feel great and am well pleased with the speed of delivery, the excellence of your service and the purity of your foods. Fast delivery. I have been drinking cocoa for the last few years and decided to try the cacao powder. Must say that it tastes great. Great value for money and would definitely purchase this product again. Extremely happy with the Organic Raw Cacao Powder. Efficient service with a pleasant online shopping experience. Looking forward to placing my next order with you. I love this product. cacao powder is so versatile and I use it in many recipes. Taste great and no nastys. 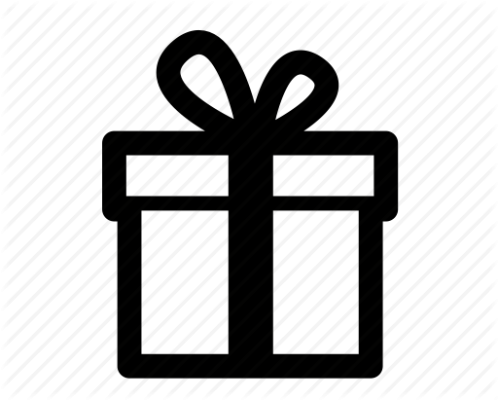 An easy web site to navigate;prompt delivery-and finally,an excellent product. I say excellent because the powder was so much richer than brand x from the local health shop. Altogether a satisfying experience. Very happy with quality of the product and fast delivery. Definitely will be ordering again, thank you. Have used raw Cacao for a long time but this is so fresh, so strong! Can’t have it in the evening as it keeps me awake. Love to put a spoon full on my freshly ground coffee beans, yea! Great service! Fast delivery again! I love your website. I appreciate that you actually treat your customers as intelligent people who want to know as much as possible, know the origin of your products and please keep scientific articles coming! Not that they are what is always needed but many customers rely on this. I love your products and have already told my friends about you! Thank you, am glad to have found you! Great products! Fast delivery. Very efficient support. That’s what it takes to be a great company. You guys have a high five from us! Please continue the great work in serving health conscious customers. I ordered this yesterday & it turned up at my house this afternoon! Amazing quality cacao, super fast delivery & great customer service as always. It was found to be an excellent product in every way. Especially for us as we adore choc style rum truffles. The recipe we used with the Cacao powder was so easy to make but sadly so quick to disappear. Thoroughly recommended. I love this cacao, it goes in everything – smoothies, bliss balls, coconut flour muffins, gooey chocolate pudding, and lately, I’ve been adding it to my oats in the morning with a bit of vanilla once it comes off the heat. Chocolate porridge – delicious! Love it!!!!!! Absolutely love it!!!!!!!! What rich tasting powder!!!!!!!!!!!!! I add it to my muesli and it became chocolate flavoured!!!!!!!! And hey you can tell me it’s loaded with tons of health benefits!!!!!!! Yeah!!!!!!!!! Superb!!!!!!!! Thank you!!!!!! My morning and night treat! I have been using this in the morning and evening in replacement of my tea. I have used other brands Cacao powders before and have always found them to be bitter. But this one is so smooth, tasty and no bitterness. Add little bit of Stevia and milk and you have your self a yummy indulging Hot Choc without the guilt. I bought myself 1KG and highly recommend you to try this. I will definitely be stocking up on some more in the future. Rich, perfectly balanced and somewhat fruity flavour. Very impressed with the quality and texture of the product itself. The way it makes me feel is even better! Beautiful cocoa product. This is a smooth powder without any grit like others I’ve tried. It’s also fresher and flavour is rich. I have combined cacao powder with 6 other super foods and take the blend daily. It replaced multivitamin supplements, and keeps me healthy. 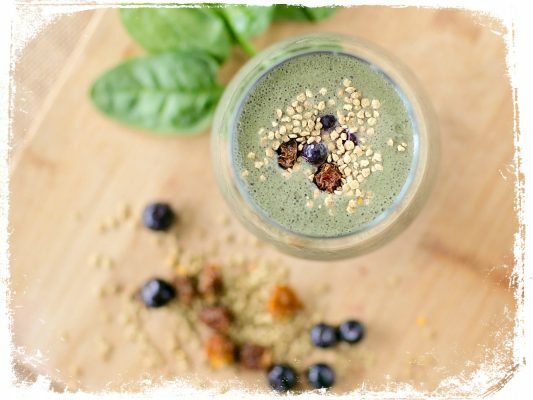 Great way to add flavour and nutrition to my smoothies. 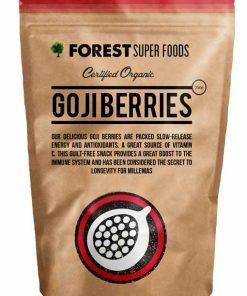 Excellent when combined with some of the other superfoods which have a taste that takes a little getting used to. Great stuff and better for my teeth than the niblets! Very happy with the fast delivery and the quality of my purchase. Smells amazing and tastes amazing! I add this to my morning smoothie with maca powder, chia seeds, coconut water, goji berries, banana, strawberries and blueberries and I love it. Makes a great chocolate flavoured drink and is good for you. Love the quality of the product & the super fast delivery. Raw cacao is so versatile, I add it to so many different things for a chocolate hit without the calories. Try it mixed with a little coconut oil, raw peanut butter & raw honey, & heated in microwave for a sweet coconut chocolate sauce! I absolutely love the cacao powder in my morning smoothies. Its rich chocolate flavour is delicious but even better its jammed packed with goodness. My order came scarily fast, and the Cocoa powder is delicious! I love the nutritional information provided about each product too. Thanks! Fast delivery and great service. Thanks guys! 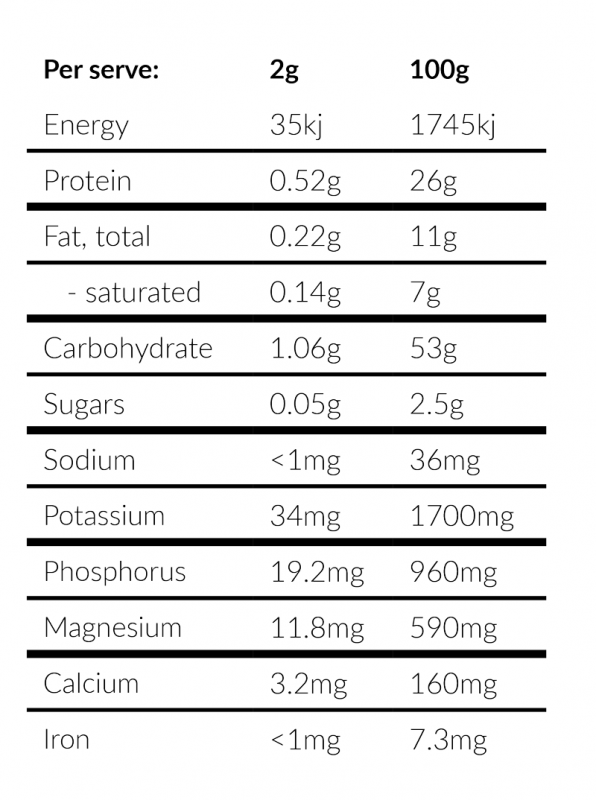 Brilliant – tastes better than chocolate and its good for you! Could do with two smaller bags rather than one very large kilo bag. It is an awkward size. Adds a yummy chocolate taste to shakes and cakes! Very pleased with product and excellent service of my order. I received my order that afternoon- nice work team! And as for the products, I have no complaints! Will de order again!! One cup of this stuff with a little condensed milk and suddenly life is worth living! I found exactly what I was looking for, very happy with product. My query was answered quickly and succinctly. Easy to use website, product arrived promptly. Very satisfied with whole experience. Hi, the goods arrived in NZ pretty quickly, prices are cheaper and the quality is awesome. I saw that they now do hemp seeds, would like to try this product very much. Nice site, great work guys! Great product with the bitterness that you would expect it to have being the natural product it is! Flavour outstanding especially when mixed with sweetened yoghurt or when making muffins, bicuits, cakes and hot chocolate!!! YUM!